I first visited New Orleans 32 years ago, falling in love with the place on sight. I was entranced by the (Mississippi) river, the music, the art, the people, and the city’s look and spirit. I’ve eagerly returned thirty-plus times in the years since. I hit these streets — every time — just as fiercely happy as the first time. However, this time is particularly special.That’s because I have the honor of being part of a great New Orleans tradition, one that combines the city’s music, art, people and history in a singular way.That tradition is “Jazz Fest,” the New Orleans Jazz & Heritage Festival. Steve and I have attended 26 years of its 45. Our plan is to keep coming back as long as we can. We feel a part of it. But, this year, I will get to be part of it in a different way: tomorrow, I will be signing Every Day Is Election Day in the Jazz Fest Book Tent. Great authors telling great stories have been in the Book Tent for many years. 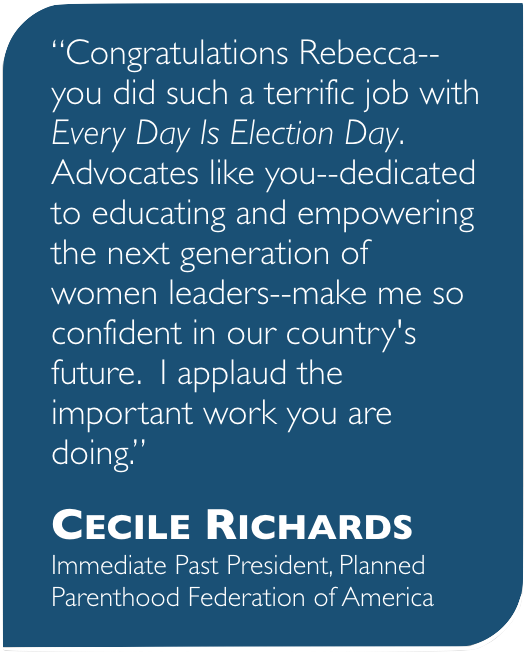 Every Day Is Election Day and I now get to share in that history because the book features three amazing Louisiana women: U.S. Senator Mary Landrieu, now running for re-election; Catherine Kimball, first woman chief justice of the Louisiana Supreme Court; and Sharon Broome, State Senator and President Pro Tempore of the state senate. Happy to have written this book? Yes, absolutely thrilled to share in the lives of women who care, stand and deliver; happy to tell their inspirational stories and impart their advice to other women who would lead; happy to be part of a community that respects committed women leaders everywhere. Thanks to Jazz Fest, Garden Street Book Shop, Gambit, and dear friend Ben Sandmel for making this New Orleans-time so special.